Primary school students from Htee Klo Thaw village in Hlaingbwe Township will be starting the 2015 academic year in a new school. The Karen Community Based Network Group is finalizing the school construction project to have it ready for the students. The KCBNG, are based in the East Dawna Ranges, began its school construction project in November 2014 with funding from the Norwegian People’s Aid. Naw Sandar Wine, a project coordinator of KCBNG spoke to Karen News about their project. 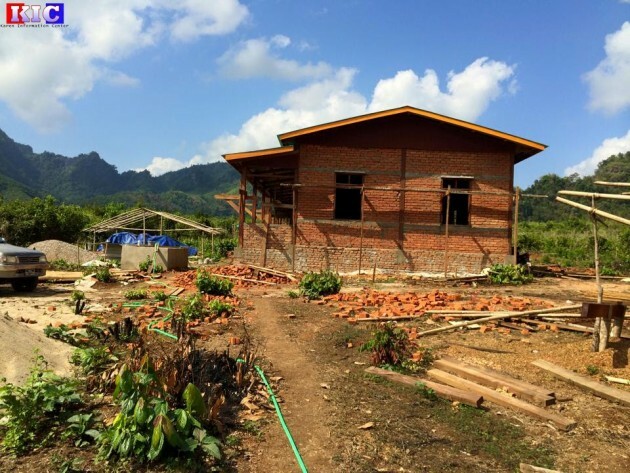 Naw Sandar Wine explained to Karen News that KCBNG requested permission to build the school from all the relevant government authorities – the Karen State government, Karen National Union and the Democratic Karen Benevolent Army. The total cost for the project is more than 1.4 million Thai Baht (around USD $50,000). The KCBNG said that the Htee Klo Thaw School will have four classrooms that will host primary students from five villages – Htee Klo Thaw, Htee K’Nae, K’lu Htaw and other two villages in the area. The school will teach the the Karen Education Department curriculum. Currently, Htee Klo Thaw village has a self-established primary school for first to fourth grade with 60 students and six teachers – a village self-funded teacher and five teachers provided by the government. The subjects taught at the school include Burmese, English, Mathematics, Science and Karen. Saw Law Eh Moo, secretary of the Karen Education Department spoke to Karen News about the new school. KCBNG was formed in August 2013 to work in Easter Dawna Range areas in maintaining Karen literacy and to encourage community members to be involved in leadership projects in the areas.